Dab under eye area to dry to a blissfully non-sticky finish. A refreshing eye gel, containing arnica and orange flower water – the essential prescription for perfect peepers. Sinks in very quickly so only a small amount is required. SKU: 6811745 Categories: Anatomicals Under Eye Care, Face Care, Popular, Quick add ons, The Fashionista Mama. 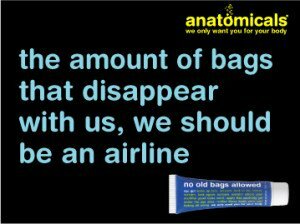 Tags: €10 & under, anatomicals eye gel, anti wrinkle cream, baggy eyes, eye gel, no old bags allowed, Revitalising Eye Gel No Old Bags Allowed - Anatomicals, revitilise eye gel, tired eyes. Eyes are the windows to the soul. don’t allow yours to look like they belong in derelict building that’s just been vandalised again, by keeping this tightening gel handy. after all, there’s only one place for bags in this world. under the arms of a yummy Beverly Hills porter. If you wake up in the morning with tired and baggy puffy eyes this is for you. Use just a small amount of this and it could help quite a lot. The best thing about it is that it is a light, non-greasy formula. This is perfect as it works well under makeup. Bye bye eye bags. Don’t worry if the morning after the night before has left you with dark circles and under-eye bags. 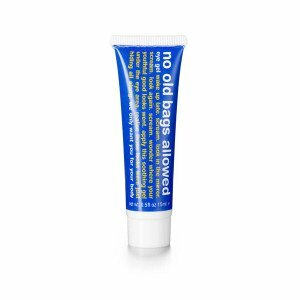 Now there’s a way to combat eternal fatigue with Anatomicals No Old Bags Allowed, a refreshing eye gel, containing arnica and orange flower water – the essential prescription for perfect peepers. This on-the-go gel can be used under or over your makeup and isn’t claiming to be a wrinkle-free treatment. Instead, it’s just a way to really brighten up your eyes. Dries to a blissfully non-sticky finish. The top 5 ingredients are: Aqua (Water), Glycerin, Glyceryl Polymethancrylate (Film-Forming Agent), Proplylene Glycol (Synthetic Moisture Absorbing Liquid), and Citrus Aurantium (Orange Flower Water).